Halloween is all about the creepy atmosphere, but you don’t have to turn your house into a full-blown haunted mansion to show your guests a hair-raising good time. Picking out a few key Halloween decorations will turn your party into a spookfest. Just think tactically! Here are a few hassle-free Halloween party decorations that will have your friends screeching with delight from the minute they knock on your door. Give your guests a little Halloween party preview by welcoming them to your home with mood-setting outdoor decorations. Line your walkway with fall mums on each side, and wrap them with spooky string lights. 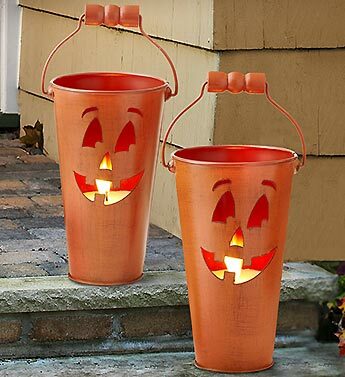 Place a Halloween lantern and a few mini pumpkins between each mum to complete your grand entryway. At your doorstep, have a candlelit Jack-o-lantern and a crafty little witch—like this Bewitching Halloween Plant—awaiting your partygoers with a plate of chocolate, trick-or-treat style. Once your friends have picked up their sweet treat and are ready to ring your doorbell, shock them by hanging a Glittered Halloween Wreath on your front door. With such a chilling reception, your guests will be ready for some Hallow’s Eve revelry! Now it’s time for the highlight of the night: the dinner table. Lay down a black tablecloth and a purple table runner, and sprinkle plastic orange spiders and Halloween confetti across the table. Place two golden glass hurricanes—like the Fall Harvest Trio—on either end of the table and light them up with votives. Only a scream-worthy floral centerpiece should be spotlighted at the center of the table, and we know two that will get your guests’ blood boiling. The attention-grabbing Itsy Bitsy Spider Flower Cake and Shocktail Bouquet are crawling with fresh neon-colored flowers and eerie lifelike critters. Whichever you choose, your dinner spread will be a satisfying sight for hungry eyes. Scatter some ghastly good cheer throughout your Halloween headquarters with a few festive accent pieces. These Halloween Bottles and Tea Light Holders are a wickedly fun touch for your bar top or coffee table. Cast a supernatural glow over your fireplace mantel, dessert table, or hallway with a Tea Light Pumpkin Tree. If kids will be joining your festivities, filling each room in your house with these Air-Rangement Halloween Mylar Balloons will take their night of mischief to new heights. What kinds of decorations do you like to use to thrill and chill your guests on Halloween night? Have a Beach Inspired Thanksgiving!